Eminent scientist R A Mashelkar was on Monday conferred the Padma Vibhushan, the second highest civilian award, while acclaimed artiste Kamal Haasan and ace shuttler P Gopichand were among the 12 personalities conferred the Padma Bhushan by President Pranab Mukherjee in New Delhi. Award winning actor Vidya Balan, coach of Indian women kabaddi team Sunil Dabas, sand artist Sudarshan Pattnaik and activist Jawahar Lal Kaul were among the 53 personalities conferred the Padma Shri award at a ceremony held at Rashtrapati Bhawan's Durbar Hall.
. The award ceremony was attended, among others, by Vice President Hamid Ansari, Prime Minister Manmohan Singh, his wife Gursharan Kaur, Union ministers Sushuilkumar Shinde, P Chidambaram, Sharad Pawar and Sriprakash Jaiswal, and Chief Election Commissioner V S Sampath. UPA Chairperson Sonia Gandhi and leaders from opposition and other political parties were not present. Mashelkar (71) is well known globally for his path breaking research in polymer science and engineering. He has chaired 12 high powered national level committees to look into diverse issues of higher education, national auto fuel policy and measures to deal with the menace of spurious drugs. Anumolu Ramakrishna, who pioneered the use of precast concrete technology, was conferred the Padma Bhushan posthumously. He passed away last year at the age of 73. Kaul (69), known for his voluntary services for the blind, had lost his eyesight due to smallpox at the age of five. The President climbed down from the podium to confer the Padma Shri on him. Air Force, a newly acquired US-made C-130J transport aircraft on Friday crashed near Gwalior after taking off from Agra air base, killing five crew members, including four officers. Two Wing Commanders, two Squadron Leaders and another crew member were killed in the Super Hercules Special Operations plane crash, Defence PRO said in Jaipur. "One C-130J aircraft crashed 72 miles (115 km) west of Gwalior air base. The aircraft was airborne from Agra at 1000 hours for a routine flying training mission. A Court of Inquiry has been ordered to investigate into the cause of the accident," an IAF spokesperson said in New Delhi. Senior officials, including Superintendent of Police, Karauli, have rushed to the spot of the crash along Rajasthan and Madhya Pradesh border. India had recently inducted six C-130J Super Hercules aircraft, which were bought from the US at the cost of around Rs 6000 crore (USD 1.1 billion) three years ago. The per unit cost of the aircraft comes to around Rs 1,000 crore. The home base of the 77 squadron 'Veiled Vipers' operating the aircraft is Hindon in Ghaziabad near New Delhi. The aircraft can carry upto 20 tonnes of load and can land and take-off from short runways. IAF had recently landed the aircraft at the high-altitude Daulat Beg Oldie air field near China border. The planes have augmented IAF's capability to airlift troops closer to the borders in times of emergency, Air Force officials said. They said Air Force Chief Arup Raha has briefed Defence Minister A K Antony about the crash. Senior officers from the Air Headquarters have been dispatched to the crash site, they said. Local IAF units have also rushed officers and men in choppers to the accident area, they said. The multi-role special operations aircraft had been used recently in the search operation for the missing Malaysian airliner MH 370. The Defence Ministry had recently signed a contract with the US government for procurement of six additional C130J planes which are to be deployed in Panagarh in West Bengal. The menu for Global Scenarios has been enabled. Comparison of Scenarios of IEA, EIA and WEC is presented for Primary Energy Consumption, Electricity Generation and Co2 Emissions. Oil prices eased in Asian trade today as traders booked profits after strong gains last week on positive US economic data and the tensions in Ukraine. India’s power deficit has contracted to a record low of 3.3% in February but consumers and producers continue to suffer as many people suffer blackouts. CERC’s move to allow compensatory tariff for Mundra projects of Tata Power and Adani Power has been challenged before Appellate Tribunal for Electricity. Tata Power has sought compensation from CLP Holdings for wrongly announcing the commissioning of its 1,320 mw Jhajjar Power project. Mahavitran will sell 100 MW power to Brihanmumbai Electricity Supply and Transport Company (BEST), which supplies power to the island city, after settling issues concerning availability of power in rest of the state. The country’s largest power producer NTPC has set a target of importing as much as 15 million tonnes of coal in the next financial year (2014-15). A Delhi court today fixed May 2 for considering the charge sheet filed by CBI in coal blocks allocation scam case against Navabharat Power Pvt Ltd and its two directors. If you find the content useful, may we request you to kindly share “Energy News” with people you know. Boletín informativo. Domingo 30 de Marzo 2014. "La formación profesional es un derecho de los trabajadores y una necesidad para el país"
Javier López reivindica la formación como un derecho de los trabajadores y una necesidad del tejido productivo, señalando que el futuro de las empresas tiene poco que ver con los bajos salarios y más con la inversión productiva y formativa que permita contar con trabajadores y trabajadoras cualificados, capaces de adaptarse a los cambios y comprometidos con un proyecto productivo. Para el secretario de Formación de CCOO, "seremos como país lo que aporten las personas formadas durante esta crisis". Este año, la Fundación Vallecas Todo Cultura cumple 35 años. 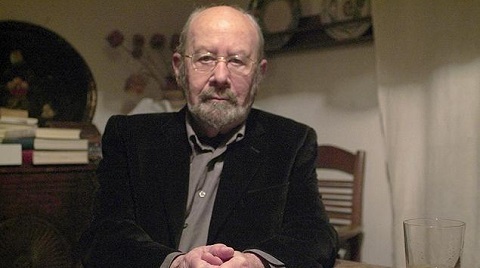 Va a celebrarlo de una manera muy especial: homenajeando, en la edición 2014, la XV edición de Vallecas Calle del Libro, al premio Cervantes José Manuel Caballero Bonald. MARCA UN "HITO HISTÓRICO NEGATIVO"
Por primera vez desde 1991 los ingresos en la lucha contra el fraude no superan los resultados del año anterior. ¿Qué diferencia hay entre estar exento de pagar impuestos y tener que declarar a Hacienda? La respuesta a esta pregunta es de carácter técnico, ya que los importes que legalmente están exentos no se integran en la declaración del IRPF. · Juan Torres López: ¿Para qué sirven las previsiones del Banco de España? ¿Donde está el empleo verde? 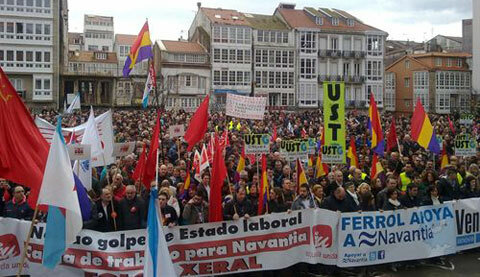 BAJO EL LEMA "SECTOR NAVAL UNIDO VENCERÁ"
Miles de personas han salido a la calle en Ferrol para "defender el naval" y "defender la comarca" en una protesta convocada por los Comités de Empresa de Navantia. Un total de 10.469 españoles inmigrantes en Alemania estaban cobrando la ayuda estatal "de seguridad básica para solicitantes de empleo" al cierre del año pasado. Está recibiendo este boletín tras solicitar este servicio a través de la web de Nuevatribuna. En cualquier momento puede modificar o cancelar su suscripción accediendo a esta dirección. Nuevatribuna Información continua y análisis para una ciudadanía comprometida con los valores de libertad, igualdad y justicia.